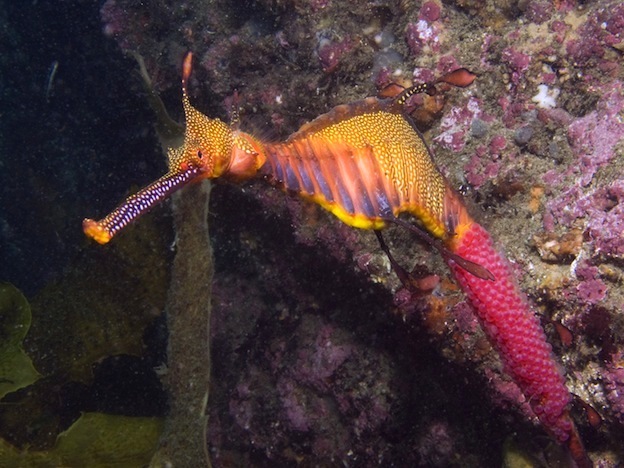 One of the popular species of seahorses is the Weedy Sea Dragon. It can blend in very well to the surroundings. In fact, you may have seen them but thought you were just viewing various types of weeds floating around in the body of water. They are very popular as pets and tend to have a higher survival rate in that state than other species of seahorses. If you decide to keep one you need to do your homework first. They need a very special type of environment. The can reach a maximum length of 15 inches but they are typically much smaller than that – around 12 inches. They are colored based on what is around them. Usually they are a green or a tan color to match the colors of the various weeds that would be around them in a natural setting. They have a body that seems to have many ridges and details in it compared to many other species out there. The Southern coastline and the Western regions of Australia are home to the Weedy Sea Dragon. Some portions of Tasmania also feature them. The are often found living among the seaweed beds. They blend in with them very well though so you will have to look closely at them. They have also been bred in captivity in Florida, Tennessee, and areas of Georgia. There is a protection act on the species as a whole in Australia. This is due to them being considered near endangered. Even so there are many sales of them as pets on the black market, they are used for medicine, and they are commercially gathered. 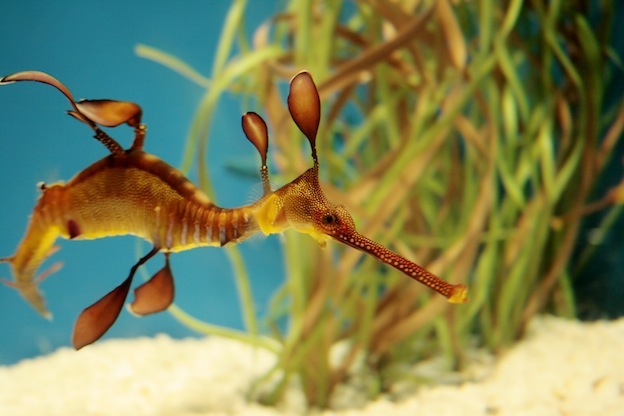 Since the Weedy Sea Dragon doesn’t have a prehensile tail they aren’t able to anchor. These seahorses move very slowly in the water. They try to still to slow moving water so they can save energy and remain in control. Plankton, small shrimp, and various forms of crustaceans are the diet for the Weedy Sea Dragon. They often have to look in small crevices and other out of the way places for their food. Since these seahorses do blend into the surroundings so well though it is easy for them to catch prey off guard. All prey is swallowed whole through their snout and down a pipe. They don’t have a digestive system which is why they eat often and they eat slowly. They can only consume food that is the size of their snout or smaller. As various types of prey get larger they will have to be passed over. When a pair are ready to mate they will take several days to do so. First they are going to spend time with a variety or rituals that are called courtship. This allows them to mimic the movements of each other. Only when they have that down can the females put the eggs into a sponge like patch on the tail. This is one of the few species of seahorses where the male doesn’t have a pouch to hold the eggs. Like all seahorses it is the male who will carry them and give birth to them. The gestation period is about 8 weeks. As the young emerge they will instinctively be able to care for themselves. This can be tough to do though with an array of predators around including penguins and fish. The mortality rate is about 98% in the wild for this particular species of seahorse. That is why with high numbers of them being captured for commercial fishing and to use for medicine they are dropping fast in their overall numbers in the wild.